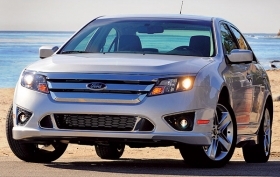 Fusion: Powering Ford's first U.S. market share gain since 1995. LOS ANGELES -- Ford Motor Co. will see its first U.S. market share gain since 1995, but the automaker is not relying on that trend to continue. Jim Farley, group vice president of global marketing, said today that Ford is gaining 1 percentage point of retail share in the crucial California market, but in surprising segments. While sales of crossovers and the F-series pickup have been strong, most of the share gains have come with the Escape crossover, Fusion sedan and Fusion Hybrid. And despite the launch of the newer Chevrolet Camaro and Dodge Challenger, share for the Mustang pony car is up in California. Farley expects the new Taurus sedan to add to those gains, although he cautioned: "Our business plan was never to count on share growth. The share gains have been a bit of a surprise." Asked whether the gains were a swap with lagging Chrysler, Farley said, "We're not gaining from Nitro and Sebring." Ford's share gains have declined somewhat of late, as GM's marketing spending has increased. Said Farley: "We do foresee future months like February, with the Chrysler sell-down. We are completely transitioned to 2010s, while some of our competitors are still in 2009s and in sell-down mode. We're not going to chase them down the drain hole." Ford's longer-term marketing plan will be to avoid direct comparisons to other domestic brands. Instead the company will target large international players such as Toyota and Volkswagen with a value and pricing message. Farley said the content levels of base-model Fords will increase so that there are no stripped-down price leaders. He predicts the average purchase price for Ford vehicles will increase. Said Farley: "Our value story is really our business plan."